Benjamin Franklin, the American polymath, once referred to magic squares as “difficiles nugae”, troublesome trifles “incapable of any useful application” and, as such, unworthy of the precious time of serious individuals. Hardly can one follow this line of thinking, as some considerable amount of Mathematics, probably including Euclid’s “Elements”, could thus be described as detached from practical applications and therefore similarly unworthy. Anyway, Franklin denied his own statement as he apparently spent not a trifle of his time in compiling some quite remarkable magic squares himself. A magic square of order n (often called normal magic square) is a square arrangement (or matrix) of the integers 1 to n^2 in such a way that each row, column and diagonal yields the same sum, which is called the “magic constant”. 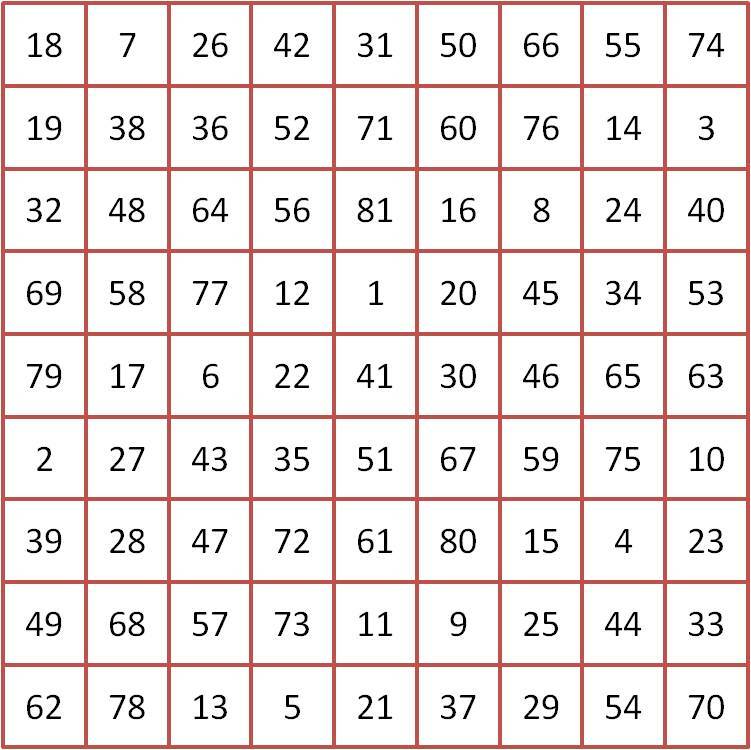 Through history, magic squares have fascinated mystics, artists and mathematicians alike and their study, probably going as far back as the 7th century B.C., involves quite a few ingenious minds. By medieval times, magic squares were connected to the occult and became talismans or instruments of exercising astrology and alchemy. Rabbi Abraham ben Ezra (1092 – 1167), a Jew from medieval Muslim Spain, associated magic squares to gematria, the belief that assigning numbers to letters reveals secret meanings or messages hidden in sacred texts. The German Renaissance philosopher and occultist Henry Cornelius Agrippa von Nettesheim (1486 – 1535) produced seven magic squares of orders 3 to 9 and proceeded in associating them to the seven known heavenly bodies of his time, Saturn, Jupiter, Mars, Sun, Venus, Mercury and Moon. 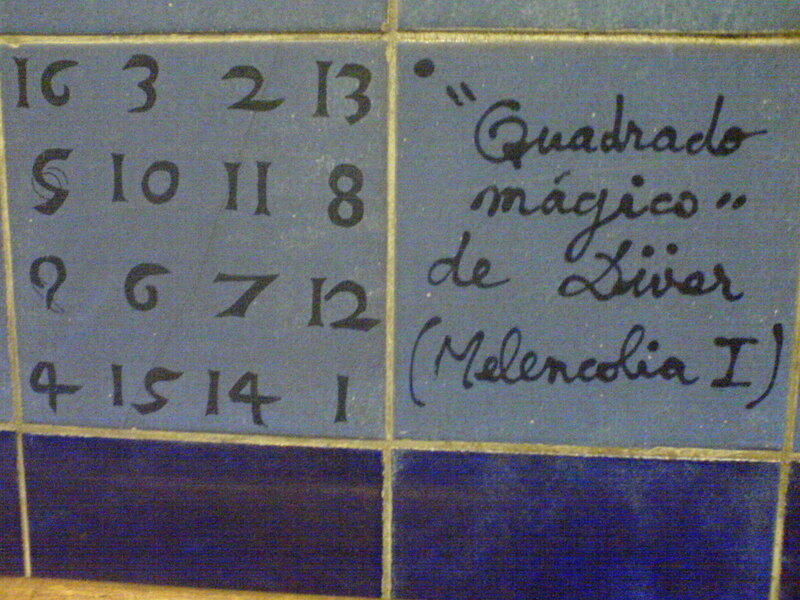 In his “De Occulta Philosophia” he describes the astrological properties of each of his magic squares as a talisman. Jupiter’s magic square for example, the one of order 4, “conduces to gain riches and favour, love, peace and concord and to appease enemies and to confirm honors, dignities and counsels”. These are achieved when the square is “engraven on a plate of silver” while when engraved on coral, according to Agrippa’s approach, the square “dissolves enchantments”. A closely related magic square appears on the notorious Albrecht Durer’s engraving “Melencolia I” (1514), where it supposedly serves as an astrological antidote to the saturnine induced temperament of melancholy. And even today, an obscure mystical symbolism is often attributed to magic squares, such as the not so elegant, magic square type arrangement carved on the Sagrada Familia basilica façade in Barcelona, a century old work-in-progress designed by the ingenious Catalan architect Antonio Gaudi (1852 – 1926). Closely connected to Durer’s square and having a magic constant equal to 33, the so called “Subirachs’ square” (named after Josep Maria Subirachs, the sculptor who created the façade) is supposedly meant to convey, rather naively, the age of Jesus Christ at crucifixion. The first westerner to detach magic squares from mysticism is the largely unknown Manuel Moschopoulos, a 13th century Greek Byzantine scholar whose work on magic squares remained forgotten for four centuries until the French mathematician and astronomer Philippe de la Hire (1640 – 1718) accidentally found the manuscript numbered 2428 at the Royal Library of Paris and translated it into French. At a time when polymathy was common amongst the scholars, Moschopoulos cannot be considered as a mathematician by a strict sense, as his main interests were towards philology and the promotion of classical studies. Yet his “Essay on the determination of number squares” (ΠΑΡΑΔΟΣΙΣ ΕΙΣ ΤΗΝ ΕΥΡΕΣΙΝ ΤΕΤΡΑΓΩΝΩΝ ΑΡΙΘΜΩΝ) is exceptional in several aspects and especially in detaching magic squares from the realm of superstition and placing them in the realm of Mathematics, where they actually belong. Two centuries before Agrippa’s astrological approach, Moschopoulos appears to be completely indifferent on the possibility of talismanic nature of the magic squares and treats them coldly as number arrangements, which is exactly what they are. His essay is of practical nature and restricted only to squares of “evenly even” order (i.e. a multiple of 4) and squares of odd order. Using his methods, Moschopoulos arrives to several examples of magic squares, including one of order 8 and one of order 9. It took another 400 years for the Christian west to make an approach similarly rational to that of Manuel Moschopoulos. In 1693, French diplomat Simon de la Loubere published in his work “Du Royaume de Siam” (“About the Kingdom of Siam”, 1693) a method of constructing magic squares of odd order, which is strangely related to the bishop movement in chess and, according to the author, originated from India. To understand the method, let’s consider a bishop starting its tour on a 5X5 square grid, inscribing the number 1 at the top middle square. As the bishop moves up and right, one square at a time, the numbers 2, 3, 4 etc. are inscribed successively in each square. When the bishop arrives at one edge of the checkerboard, the route resumes from the corresponding square of the opposite side, as if the grid were wrapped around a cylinder. When the move is blocked by an already numbered square, the bishop jumps one square down of its current position and resumes. The bishop tour method was well known to the obscure 18th century mathematician Muhammad ibn Muhammad al Fulani al Kishnawi, an African of the Fulani tribe, born in Katsina (now Nigeria). In his surviving works, written in Arabic, apart from the bishop tour, Muhammad ibn Muhammad presents a similar method applying a knight’s tour. It took the extraordinary genius of Swiss mathematician Leonhard Euler (1707 – 1783) until the first method for the construction of magic squares based on analytical foundations was devised. Euler, a quite prolific producer of mathematical results, spent much of his life in St. Petersburg, Russia, and in 1776, apparently after not too much effort, he delivered at the local Academy a work which was much later published under the title “De quadratis magicis” (Commentationes Arithmeticae 2, 593 – 602, 1849). 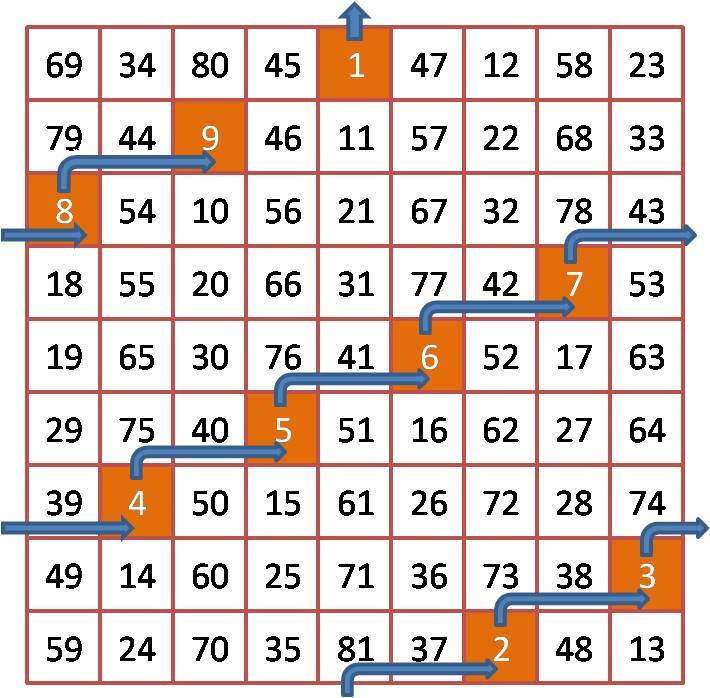 Euler’s paper was an original and ingenious attempt to provide a method of construction of magic squares decomposing every entry of the square into two components. He observed that all integers from 1 to n^2 can be expressed by the formula mn+k as each value of m=0, 1, … , n-1 is combined with every value of k=1, … , n and represented the first component mn using Latin letters and the second component k using corresponding Greek letters. 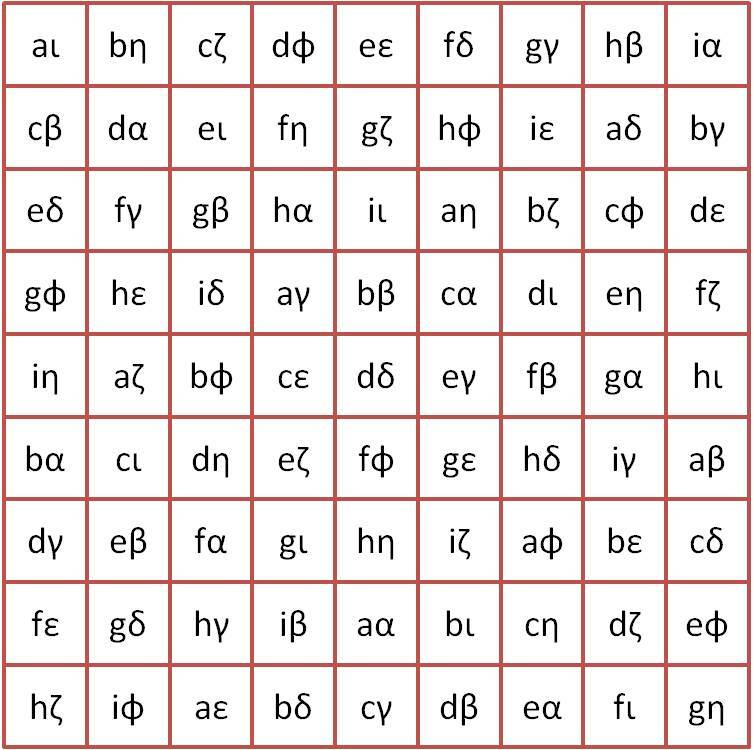 Each set of letters was then arranged on square grids, in such a way that every letter appears only once in each row and column. Euler proved that the combination of the Latin and the Greek square, called a “Graeco – Latin” square, can produce, under certain constraints, a magic square. Beyond the algebraic technicalities, magic squares, with their symmetries, regularities and peculiar construction methods, unquestionably bear some mystery and beauty that is not unreachable by non specialists. And indeed, consciously or not, magic squares have become a source of artistic inspiration. 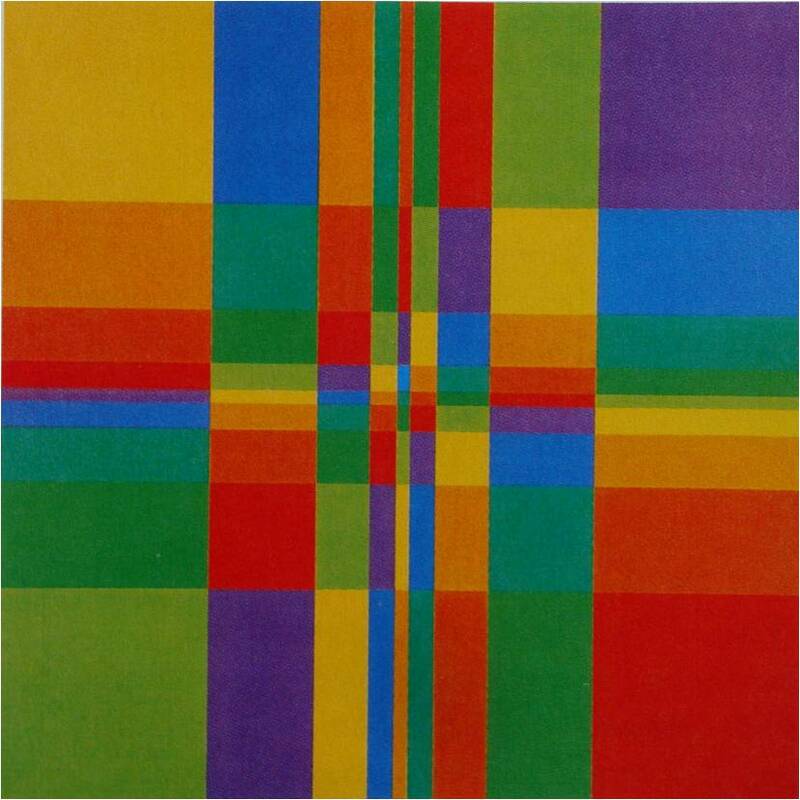 During his some 60 year long productive life and especially after 1942, the Swiss graphic artist Richard Paul Lohse (1902 – 1988), created a number of grids dominated by extraordinarily vibrant colored orthogonal fields. A representative of the “concrete art” movement which advocated that geometric forms and planes were concrete values with their own reality, Lohse was a quite rigorous artist whose works displayed mathematical or even concealed numerical regularities. Several of his works seemed to call for the viewer’s attention to uncover these regularities which, beyond the colors and shapes, appeared to be the main theme of Lohse’s invention. His rather aptly titled “Nine Vertical Systematic Color Sequences with Horizontally and Vertically Increasing Density” is an obviously geometric arrangement of mesmerizing colored orthogonal fields proceeding in accordance to a geometric sequence. As the color sequences approach the middle of the picture, their dimensions are reduced by a factor 2, producing a 9X9 grid of variously sized rectangles and generating two symmetry axes, one along the middle column and another along the middle row. 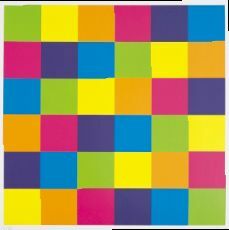 The 9 vibrant colors used are organized in the grid in a way that produces a Latin square, such as the ones suggested by Leonhard Euler in his 1776 paper. And, observing each one color’s arrangement in the grid, the knight’s tour, as described by Muhammad ibn Muhammad in the 18th century, is revealed. From this point of view, Lohse’s “Color Sequences” seems to be an allusion to magic square regularities and even provide suggestions for the historically known methods of construction of magic squares. A Graeco – Latin square produced by Lohse’s “Nine Vertical Color Sequences”. Latin letters represent the color arrangement of the work. The knight’s tour of Lohse’s “Nine Vertical Systematic Color Sequences”. Some initial steps, corresponding to the dark orange color in Lohse’s work, are illustrated. As the move after inscribing 9 is blocked, in order to inscribe number 10 the knight is shifted one square down of its current position and the tour resumes similarly. Lohse’s approach towards the symmetries and regularities of color square arrangements appears remarkably similar to the Moschopoulos’ approach towards magic squares. Lohse colored grids, such as “Nine Vertical Systematic Color Sequences”, closely related to the magic squares’ structure, are not abstractions of reality and are in no need to be associated to some obscure symbolism, such as Cornelius Agrippa’s or Subirachs’ squares. Instead, according to the “Concrete art” point of view, they appear as “concrete” entities with their own reality, part of which are the remarkable geometric and numerical regularities they display.